When selecting houseboat first make sure how many persons are traveling together. There are single bed room , two and three bed room houseboats. Most of the houseboat check-in time is 12 noon and checkout time is next morning around 9:30 am (22 Hours). Then decide which category of houseboat you need. There are Deluxe and Premium houseboat. Premium is costly as it has a upper deck. Deluxe house boat will cost approx Rs. 10000. Premium house will be another Rs 3000-5000 more. Then decide which season you are traveling. If it is off season then you are eligible for up to Rs. 2000 discount than the peak season price. Negotiate with the operator before you book. If you don’t say it you won’t get it. Then select the operator based on their service and certification. A houseboat fulfilling all essential conditions prescribed by the Department of Tourism and another five of the ten optional conditions will be awarded the status of Gold Star. Those fulfilling the essential conditions will be awarded the Silver Star. Per day house boat rate? Veg or Non Veg food ? Alleppy – Alleppy round trip tour or some other tour? Is there any additional tax or it’s the whole package rate including food? Ask to send (email) you the itinerary plan including food menu they are going to provide onboard. 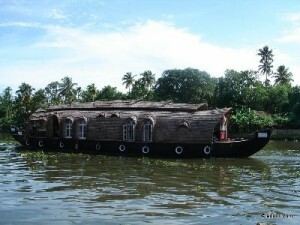 I have spent 2 days with my family in one of the houseboats in Kerala. It’s really an amazing experience. Kerala food is delicious. Especially the “Karimeen”.